DHAKA, Aug. 9 (Xinhua) -- It's a do-or-die situation for Bangladeshi Wushu stars who missed out on winning gold medals in the 2016 South Asian Games. Not to suffer the same fate in 2019 South Asian Games, the Bangladesh Wushu Association is gearing up its preparations as the medal tables are a matter of great prestige for both players and association leaders. It is for this reason that the association, this time around, has started advanced training programs for select players. In collaboration with the Chinese embassy in Dhaka, the association has organized the training in which 40 selected male and female players who won gold medals for Bangladesh in various local and foreign competitions earlier, are participating. Advanced high altitude training, as part of the special program, is helping players who are now desperately trying to recover from injuries in the run up to the next South Asian Games to be held in Kathmandu in March 2019. Eti Islam is a member of the Bangladesh Army. She has been practicing Wushu for about 10 years. She won the Wushu gold medal in the 11th South Asian Games but narrowly missed the opportunity in its 12th edition. Eti is now ready to go the extra mile to win another gold in the Kathmandu South Asian Games. "We're now preparing for the South Asian Games. I am preparing myself to win the gold medal for Bangladesh again at the South Asian games next year," said a confident looking Eti, who has acquired more skills under her Chinese coaches who are the key figures of the ongoing training. 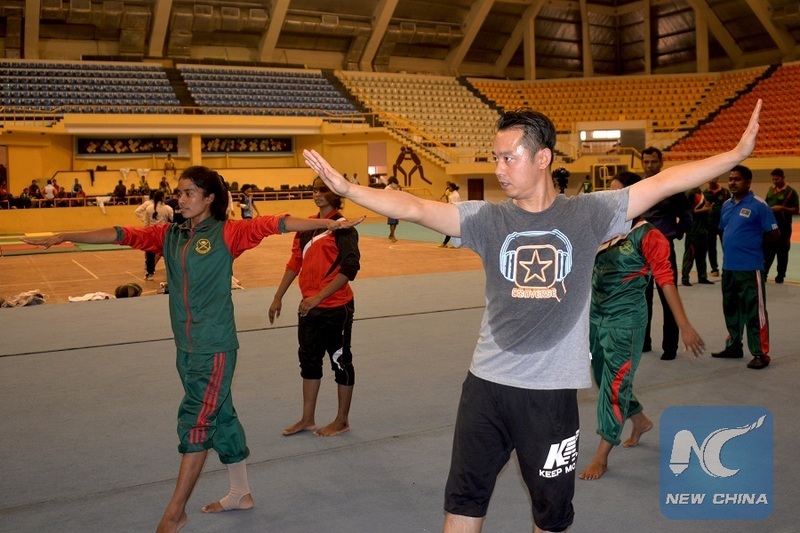 Mao Nongxuan, who is martial arts teacher at Xi'an physical education university, is currently the coach for Bangladesh trainees. "The trainees in Bangladesh like martial arts and Sanda very much. Although their level is relatively low, the physical condition of the students is very good," said Mao. "I believe the participants are very likely to win gold medals in the South Asian Games after a long training period," Mao added. Another Chinese coach Chen Jian who is martial arts teacher at Wuhan Sports University said "I have been engaged in martial arts for more than 30 years. The trainees in Bangladesh are very enthusiastic about training." "I engage and interact very well with the students, so I am very passionate when training. The goal of this student training program is to position them to break through as goal medalists in the South Asian Games and achieve better results in the Asian Games," Chen explained. The Chinese masters, along with local coaches, have been preparing the players in a two-month training program that began on July 25. "I'm so glad to receive this training from our Chinese masters. 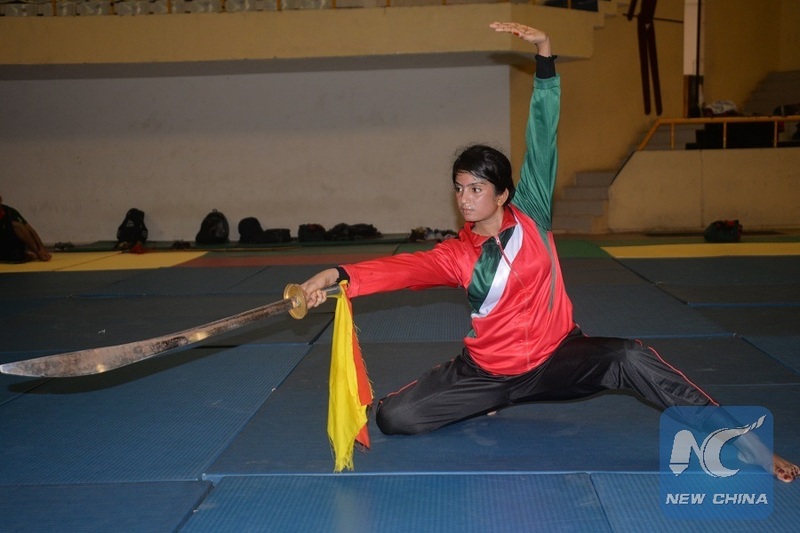 I hope we could learn more Wushu skills from our Chinese teachers," said Noor Banu Aktar, a Wushu gold medalist, who also eyes the South Asian Games' gold medal. In fact, the Bangladesh Wushu Association organized the training for 40 selected male and female players who won gold medals for Bangladesh in various local and foreign competitions earlier. Another practitioner, Fahmida Tabassum, who has practiced Wushu since 2013, said the Chinese coaches' training methods are excellent. "If could have more coaches we could really do very well." Mohammad Shariful Islam, a member of the Bangladesh Wushu Association, has expressed hope that the training under the Chinese experts will boost players' moral and help them better prepare for the South Asian Games. He said Wushu as a sports event has developed well in Bangladesh in recent years. "We will try our best to win gold medals in the 13th South Asian Games," he said. Mohammad Dulal Hossain, Joint Secretary of Bangladesh Wushu Association, expressed his gratitude to the Chinese government and the Chinese embassy in Dhaka for supporting the development of Wushu in Bangladesh. He said it would be impossible for them to organize such a long residential training course without Chinese support. "They are very good coaches. We've already noticed that. Our practitioners are also happy with their training methods," Hossain said. Alamgir Shah Bhuiyan, general secretary of Bangladesh Wushu Association, an approved body of Bangladesh's National Sports Council, said the special training held at Bangladesh's National Indoor Stadium in Dhaka has been designed to reach gold attaining targets in the South Asian Games. "We'll try our best to bring two more Chinese masters to conduct another training course for our best players," he said, adding they will make a short list of players after this ongoing training course is completed.